For a moment I thought he was actually going to do it. Harris watches his bobber as he drowns another worm. With the early summer sun beating down on us, my two older sons, ages 10 and 6, and I prepped our fishing poles on the banks of Lake Hamburg. We had completed the sweaty job of putting up our tents and setting up camp and were about to commence with the prime activity of the evening. Though I knew better, the boys were convinced we were going to catch our supper. My oldest son had opted for the artificial lure, a plastic worm he could cast and retrieve like his Paw Paw taught him. But Harris thought he needed a real worm and a bobber on his scaled down Zebco rod and reel. He reached into the Wal-Mart sack, pulled out the white, plastic container of panfish worms, tentatively stuck in a finger and even made contact with worm flesh. But that’s where it ended. His courage spent, he resorted to Plan B.
That’s when I saw it for it what it was: the modern day parenting dilemma of forcing your child to do something they perceive as unpleasant so that they can overcome it, gain self-confidence and understand that nature is sometimes a little wiggly. It was hot. I was tired already and the camping trip was only a few hours old. I gave in. During the hour or so their attention span lasted, I put three more worms on Harris’s hook. Several were slung to freedom on the bank because of over-zealous and unnecessary casting. One began the adventure of a lifetime in the low-hanging boughs of an oak tree. Not a bad view from our camp site. Soon we were joined by another camper, an 8-year-old boy named Michael. He brought over his fishing pole, helped himself to a worm and was chatting up his two new friends as he baited his hook. Harris’s face bore an expression of disgusted amazement. Michael didn’t even hesitate to grab the worm. In fact, the next night as we fished from the floating pier, Michael’s cousin, appropriately named “Fisher,” playfully cuddled a worm without a hint of apprehension or disdain. At some point, Michael’s and Fisher’s daddies hadn’t baited their hooks for them. 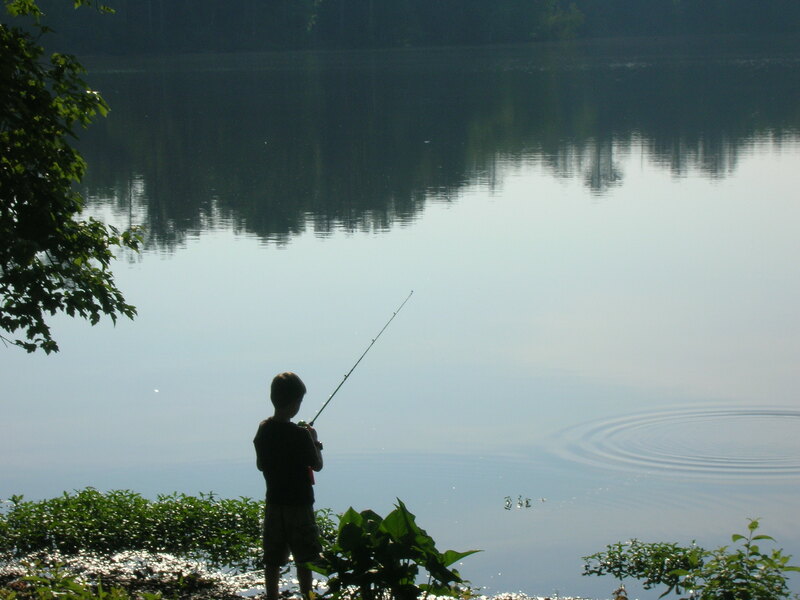 There was a formational moment in their young lives when they learned to bait their own hook. What was the difference? Well, Michael hailed from nearby Gibson, a small hamlet in the piney woods between Sparta and metropolitan Wrens. This worm wasn’t the first he had encountered. Other than previous fishing trips, my boys only see them when we do our semi-annual landscaping projects around the yard. Maybe it’s a rural-urban thing. Maybe it’s a natural instinct that’s part of a child’s personality. Or maybe, in the New South, parents don’t give their children enough opportunities to bait their own hook. I think another fishing trip is in order soon to test this hypothesis. I’ll let you know how it turns out. 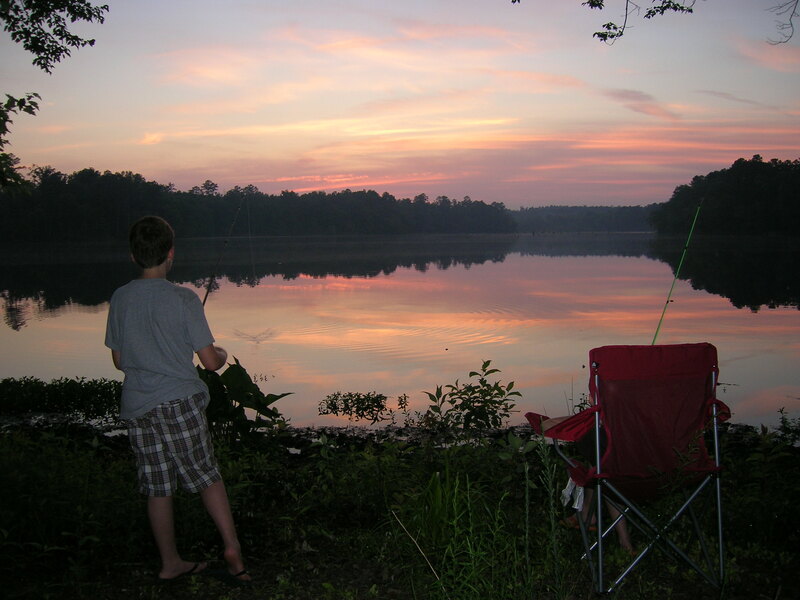 This entry was posted in Uncategorized and tagged bait, children, fishing, Hamburg State Park, hook, Lake Hamburg, Lance Elliott Wallace, Lance Wallace, New South, New South Essays, parenting, South, Southern, Southern Culture, worms. Bookmark the permalink.